The short version is that former Interbike Show Director Pat Hus is leaving to “pursue other opportunities” and Justin Gottlieb, the former Interbike communications and PR director is moving in to be the “interim show director.” Guess that’s means Emerald Expositions is still leaving the door open for a new hire. Justin joined Emerald in 2012 and has been serving as Communications & PR Director for Interbike, and Corporate Communications Director for Emerald Expositions. In addition to his involvement in strategy development on Interbike, Justin also managed Interbike features and activations, retail education development, and projects such as the Interbike Mechanics Challenge. Most of his more than 20-year career has been in the cycling/sporting goods industries, on the retail, wholesale and events side of the business. He earned a BS in Public Relations from the University of Florida, where he was a member of the cycling team, and later an MBA from Averett University. So let see, new “interim” show director, new location. Wonder what other surprises Emerald has in store for us. We’re not even sure what this means, but you can get the official word from Interbike by f0llowing the jump. 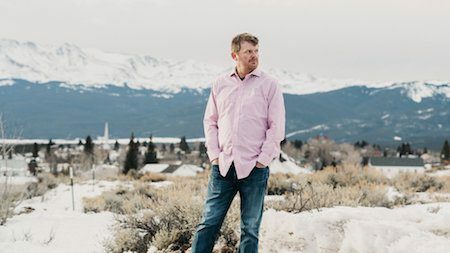 In the continuing saga of the Biggest Liar Of All Time and his doping cluster bluster, the US Government has just landed a $5 million settlement from the BLOAT and whistle-blower (and now weed businessman) Floyd Landis got $1 million. The Atlantic has all the details. We’re not interested in much of this story. If you are, please click the link. 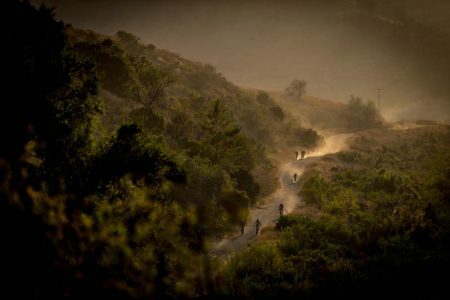 Orange County, California’s annual Ride For Rwanda mountain bike epic (April 28, 2018) can’t be done without hundreds of volunteers and organizers still need need more volunteers. That’s where you come in. Currently needed are crossing guards, course guides, and a long list of other options for various times and locations. Seriously, free food, T-shirt, and beverages? Sounds like a deal you shouldn’t pass up not to mention the thrill you get helping out a great cause. For all the details, please click the link. Cyclists and cycling fans around the world will have to chance to see the story of the first five years of Australia’s own Greenedge pro cycling team when a new film All For One shows in theaters for one night on May 2, 2018. The film gets off to a slow start and it’s a little “inside cycling,” but once it gets rolling it is well worth the ride for anyone who loves cycling. Click the link to find a theater near you. 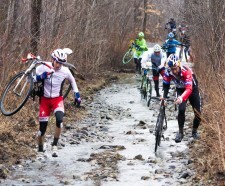 Held in Burke, Vermont the Rasputitsa Spring Classic on April 21, 2018 has 1,300 riders registered and will likely be the hard, cold gravel race’s muddiest event yet. “It’s exciting to see how much the Rasputitsa Spring Classic has grown and the camaraderie of bringing these riders together, “says event co-founder Anthony Moccia. “Rasputitsa has been a very successful effort to unite cyclists, bring economic opportunity to a remote area of Vermont, and give back to growing the sport of cycling with every dollar we profit.” . . . Rasputitsa 2018 will also see pro cyclists including Allison Tetrick, Tim Johnson, Ted King, Jeremy Power, Anthony Clark, and Lyne Bessette compete in the race. Sponsors for this year’s race include Specialized Bicycles, Garneau, Clif Bar, Woodchuck Hard Cider, Julbo, Colavita, Bialetti, and more. Guess the only good part is that it’s only 40 miles long. Follow the jump for the official word from event organizers. 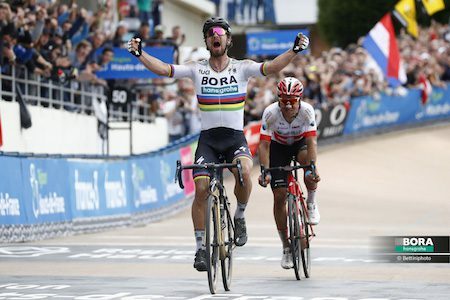 It was a race where the win had eluded the UCI World Champion for almost 40 years, but today Peter Sagan won Paris-Roubaix for the first time in his career and it was beautiful. After the BORA-hansgrohe riders executed their plan perfectly, riding hard from the start and sacrificing themselves for their team leader, the Slovak rider took over, going on an audacious breakaway move with 54km remaining that left his rivals unable to react. Teaming up with the remnants of the day’s escape, Peter extended the time gap, and as the final kilometres came into view and the Roubaix velodrome loomed large on the horizon, there was no doubting who was going to take the win. Quick to thank his teammates from the finish line for their part in his victory, Peter took away a cobblestone for his victory, his second Monument of his career and was crowned the first winner of Paris-Roubaix in the Rainbow Jersey in nearly forty years. For the rest of the story from Bora-handgrohe, please follow the jump.